Looking for a healthy take on that bowl of chocolate chip cookie dough you've been dreaming about eating? Try this sweet, protein-packed alternative! Who doesn't dream of digging into a fresh batch of cookie dough? There's just something about indulging in a spoonful of batter packed with sweet, chocolaty morsels that makes you want to eat the whole batch! Now, imagine diving into a bowl of cookie dough that's actually healthy and stocked with protein. 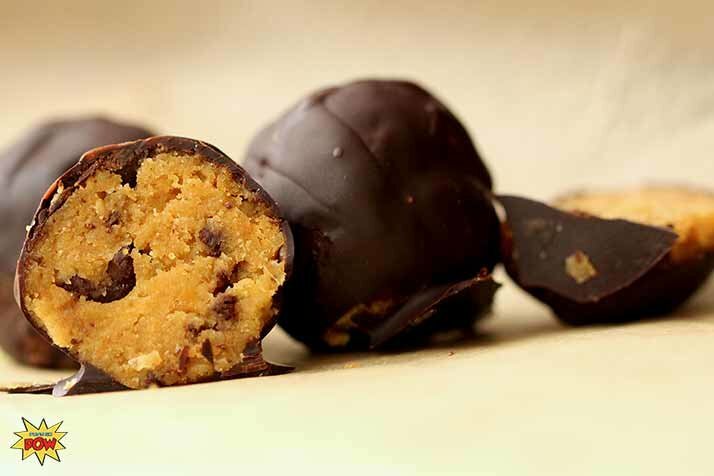 Imagine that healthy cookie dough came in easy-to-eat, individually sized truffles. Sound too good to be true? Luckily, it's not! In fact, the "secret ingredient" of chickpeas makes these protein cookie dough truffles perfect any time of day, especially when paired with a cup of coffee for a pre-workout snack! A few truffles also make the perfect afternoon treat when you feel like having a little something to power up your work day, but don't want that late-in-the-day sugar crash. You might be skeptical of the chickpeas, but when you give them a try, I promise these truffles will floor you. They're soft, sweet, and delicious! Below, you'll find a recipe for "naked" truffles, as well as a note on how to dress them up. Hint: the dressing involves chocolate! Both ways are absolutely delicious, but the chocolate-covered truffles definitely feel a bit more like a sweet dessert.